Adopted on June 13, 1950. The official state tree of New Jersey is the red oak, (Quercus borealis maxima.) The red oak was authorized by Joint Resolution 12 of the One Hundred and Seventy-fourth Legislature signed by Governor Alfred E. Driscoll June 13, 1950. 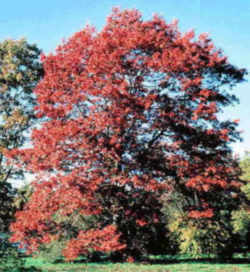 The Concurrent Resolution declared that the red oak is a representative tree of New Jersey with beauty of structure, strength, dignity and long life, that it is most useful commercially and enjoys great freedom from disease, that it is adapted to our New Jersey soils and is compatible with all native shrubs and evergreens, permitting lawn and grass areas to be successfully grown under its canopy, and that the fall color of its foliage places it foremost in our natural landscape scene. The state memorial tree is the dogwood, authorized by Assembly Concurrent Resolution No. 2 of 1951. Quercus rubra, commonly called northern red oak or champion oak, (syn. Quercus borealis), is an oak in the red oak group (Quercus section Lobatae). 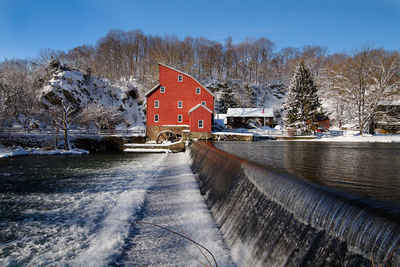 It is a native of North America, in the northeastern United States and southeast Canada. It grows from the north end of the Great Lakes, east to Nova Scotia, south as far as Georgia and states with good soil that is slightly acidic. Often simply called "red oak", northern red oak is formally so named to distinguish it from southern red oak (Q. falcata), also known as the Spanish oak. 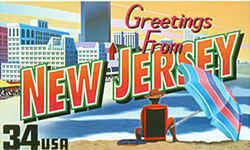 It is also the state tree of New Jersey and the provincial tree of Prince Edward Island. 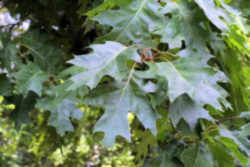 The red oak is a hardwood tree that you can recognize by its pointy-lobed leaves with prickly tips. It produces many acorns, an important food for the Native Americans of long ago. 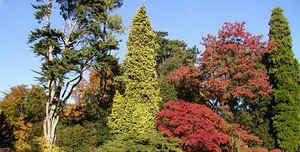 In autumn the leaves turn a vibrant red, adding bursts of color to our rural landscapes. 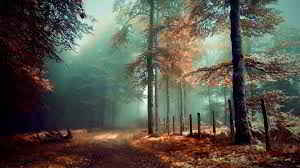 Northern red oak (Quercus rubra), also known as common red oak, eastern red oak, mountain red oak, and gray oak, is widespread in the East and grows on a variety of soils and topography, often forming pure stands. Moderate to fast growing, this tree is one of the more important lumber species of red oak and is an easily transplanted, popular shade tree with good form and dense foliage. Leaf: Alternate, simple, 5 to 8 inches long, oblong in shape with 7 to 11 hairless bristle-tipped lobes. Flower: Staminate flowers borne on catkins. Pistillate flowers borne on spikes. Appears with the leaves in April or May. 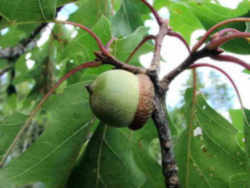 Fruit: Acorns are 3/4 to 1 inch long and nearly round. with less than 1/3 covered by the flat, saucerlike cup. The cap is flat and thick, covering about 1/4 of the acorn. Cup covered by reddish-brown, tightly overlapping scales. Matures in 2 years, ripens August to late October. Twig: Quite stout, red-brown and glabrous. Terminal buds are multiple, quite large, ovoid, and covered with red-brown, mostly hairless scales. Bark: On young stems, smooth. Older bark develops wide, flat-topped ridges and shallow furrows. The shallow furrows form a pattern resembling ski tracts. Form: A medium-sized to large tree that develops a short trunk and round crown when open grown, straight with a clear bole when grown with competition. "The State of New Jersey hereby adopts the red oak - Quercus borealis maxima (March) Ashe - as the State tree;"
NOW, THEREFORE, I, Alfred E. Driscoll, Governor of the State of New Jersey, do hereby proclaim that, by virtue of the concurrence of the Senate and the General Assembly while sitting as the One Hundred and Seventy-fourth Legislature in Assembly Concurrent Resolution No. 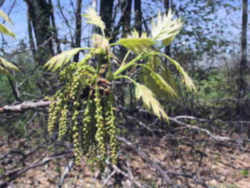 12, the red oak --Quercus borealis maxima (Marsh) Ashe - stands adopted as the State tree of the State of New Jersey. Given under my hand and the Great Seal of the State of New [SEAL] Jersey, this thirteenth day of June, in the year of Our Lord one thousand nine hundred and fifty, and in the Independence of the United States, the one hundred and Seventy-fourth.